While half of the Singletrack crew suffered in the office with sniffles and coughs, Andi and Ross escaped the lurgy filled environment and took shelter at the 2019 Burgtec Houseshow. 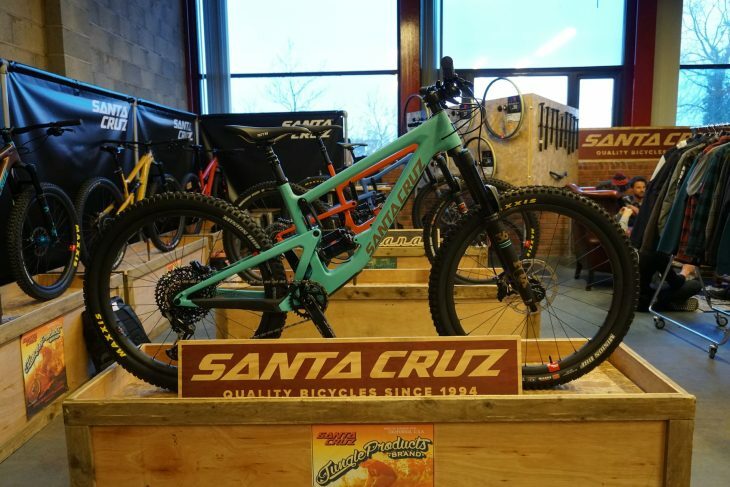 This was the first time that Burgtec had put on their very own show, and thanks to their close ties with the Syndicate, Santa Cruz and Fox also showed up to support them, along with a few big name local riders. So what’s new for 2019 on planet Burgtec? Keep scrolling to find out. 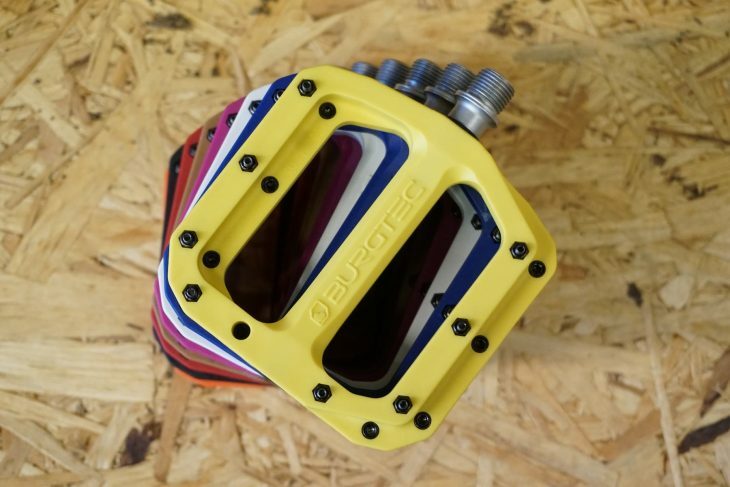 Burgtec’s Penthouse flat pedals are still happily at version 4.0 and continue to be some of the best flat pedals on the market. They’re well made, look great and are easy to service, but if we were to make one complaint about these posh flats is that they’re not exactly cheap. Like the current Mk4 only composite and more affordable. Burgtec realised there was a need for a cheaper pedal in their range, but rather than making a lower quality alloy model, they’ve taken the Mk4 and constructed it out of a composite instead. 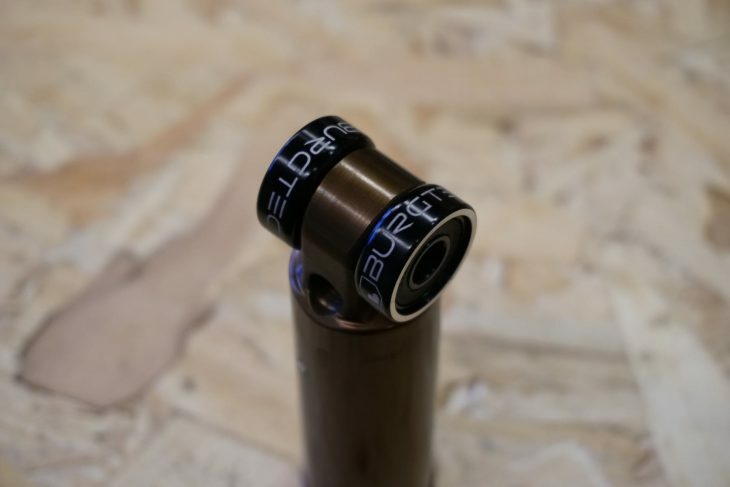 The fantastic plastic version of the Penthouse Mk4 comes with that distinct Burgtec design, features replaceable metal pins and quality sealed bushings and bearings to keep them spinning. 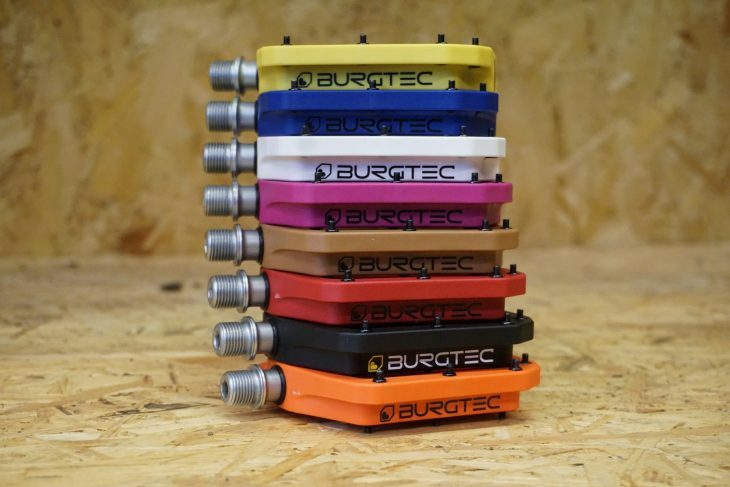 Burgtec will offer the composite Mk4 in 8 colours including black, yellow, purple, red, blue, white, brown, and orange. Pricing will be around £39.99 and they’ll start appearing in stores around March. 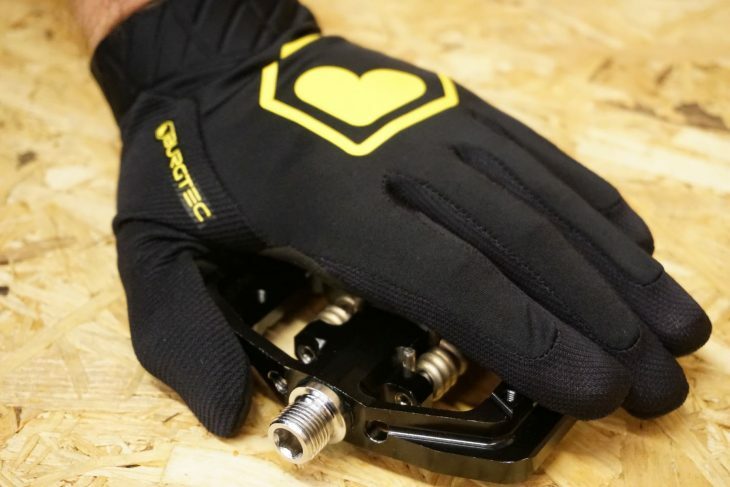 Secret Burgtec pedals hidden by not so secret Burgtec gloves. And speaking of pedals take a sneak peek at these. We’re not allowed to say much about these only that they’re being tested and that as long as everything goes to plan we should expect to see them in production sometime in the near future. 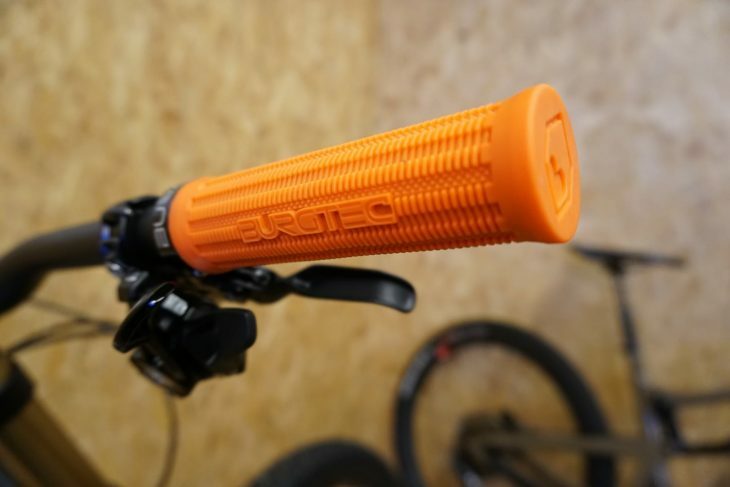 Burgtec Greg Minnaar signature grips. 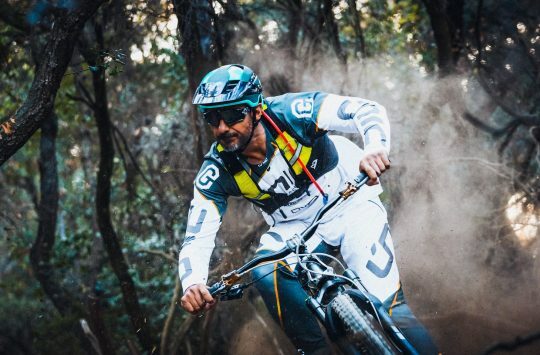 For the past year, Burgtec and South African downhill legend Greg Minnaar have been working on a new signature grip, and this is the end result. 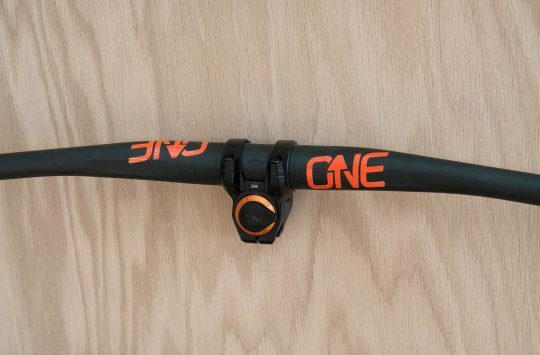 The Burgtec Greg Minnaar signature grip has a clamp on just one end while the other end sees a slight increase in diameter so that riders can feel how close to the end of the bar they are. Look great fitted to a bike too. 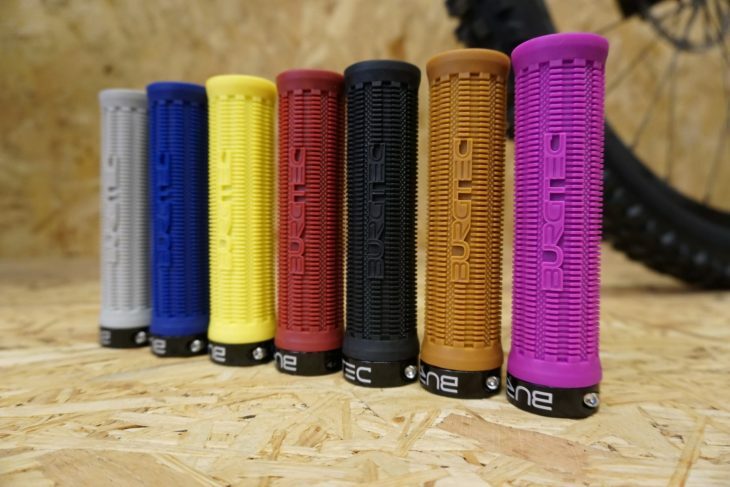 Like the composite pedals, these grips will be available in 8 colour choices and should go on sale in March. Pricing will be around £19.99. This nifty upgrade is in development right now. 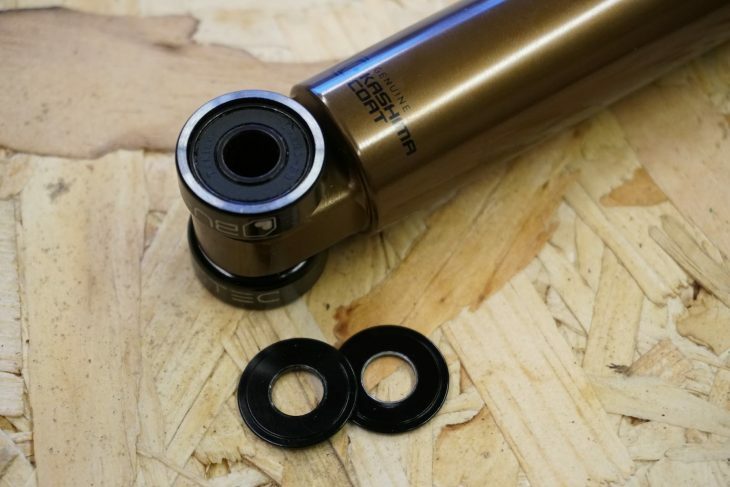 The bearing mod will only be available for Fox shocks due to clearance issues on RockShox. Not currently available to the public yet is this Burgtec made shock mounting hardware. The kit comes with a couple of bearings to offer super smooth, friction-free travel. 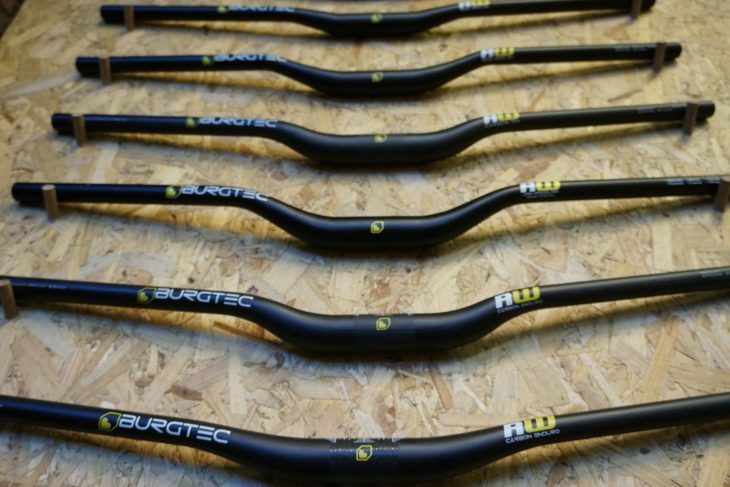 Burgtec is currently testing the kit on a number of bikes, and we hope that they’ll be made available pretty soon for test. One thing worth noting though is that the kit will only fit Fox shocks as RockShox model’s don’t offer enough clearance. Burgtec had a couple of new handlebars on display including a prototype DH bar that the Santa Cruz Syndicate will be running this year. The prototype bar will be a 30mm rise carbon bar base on the same geometry as another new bar on show, the Burgtec Ride Wide Carbon enduro also with 30mm of rise. Both carbon bars will come in at 800mm wide with a 9° back sweep and 5° of up sweep. The enduro version of the bar is on sale now for £134.99 the DH bar is expected to cost around the same but weigh slightly more. New rise options now offered. 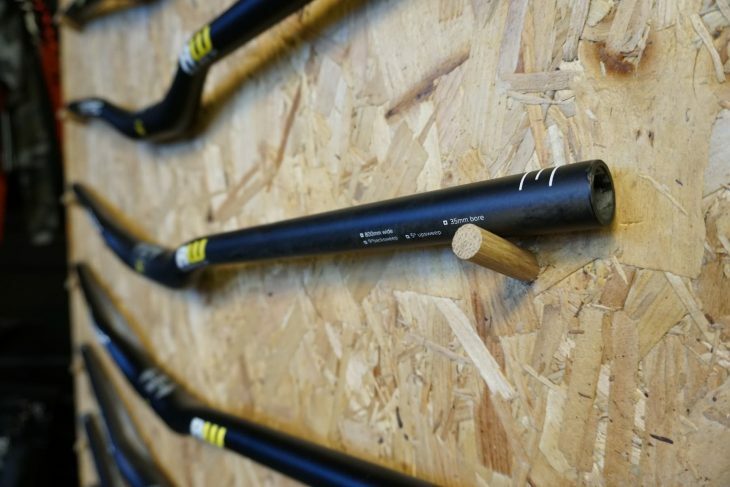 If carbon isn’t your bag then £69.99 will get you a set of the Josh Bryceland signature bars. The 7075 alloy bar weighs in at 345g with a 38mm rise, 800mm width and same geo as above. Fox had a selection of clothing on display at the Burgtec Houseshow. 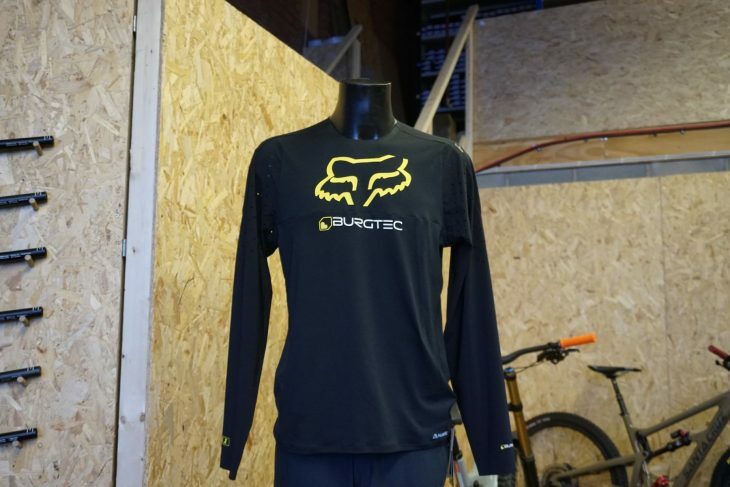 The overall Fox range appears to be more streamlined and simplified, but one item that jumped out at us is this Fox/Burgtec collab jersey. Apparently, this will be one of the first collab pieces from Fox for many many years. 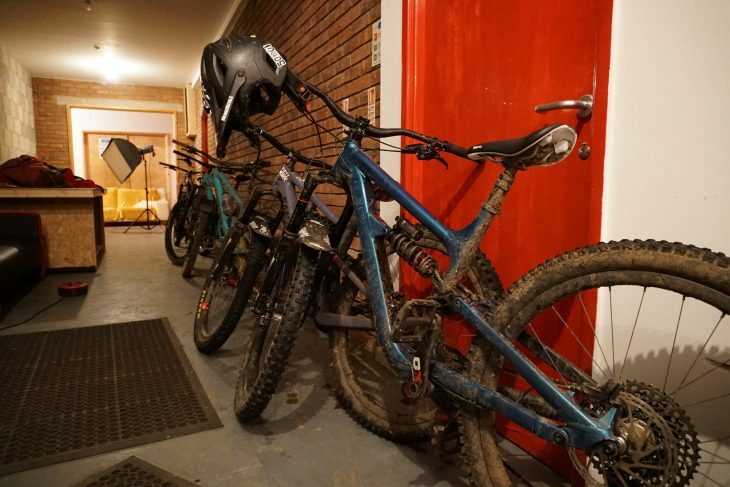 The Bronson is a bike a lot of people are talking about. 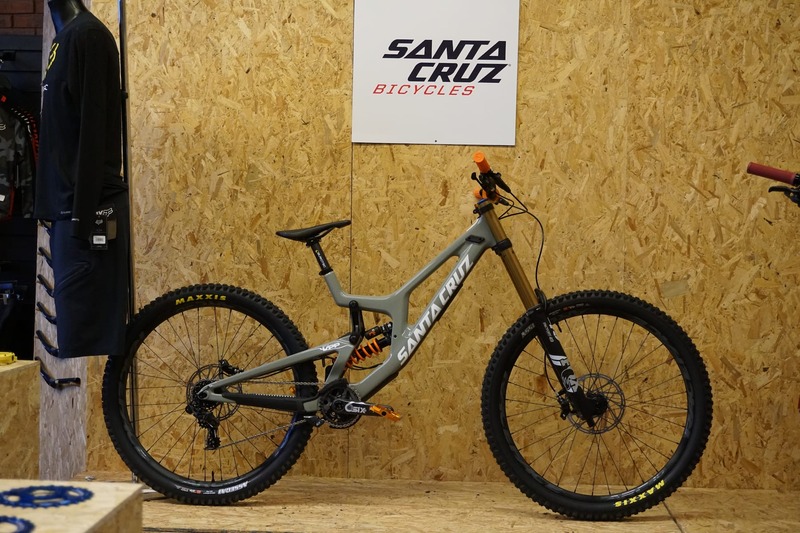 In between all of the shiny Burgtec parts was a sprinkling of equally shiny new Santa Cruz bikes. There was a mix of off the shelf and custom bikes to take in, with custom bikes featuring colour matched Burgtec components, naturally. This brand new Santa Cruz Carbon Chameleon built up with plus-sized tyres rather than the 29er model that we have on test. Custom, blue Hope components come stock on the top of the range model and perfectly match the blue decals on the frame. 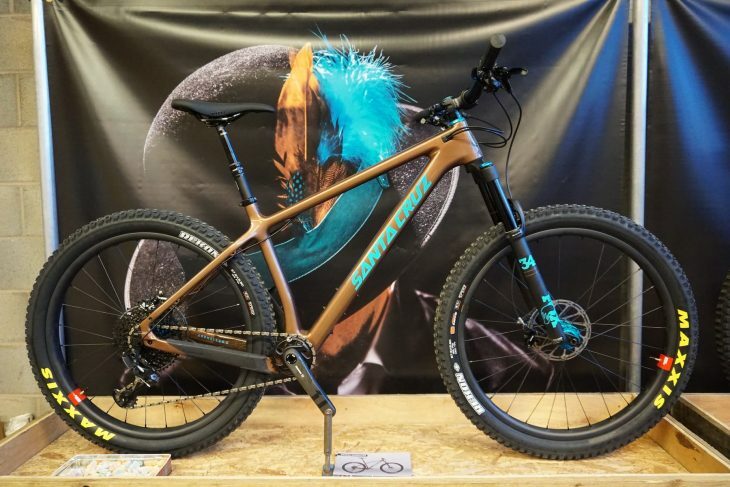 This is one tasty carbon hardtail. Made for going downhill fast. This V10 gets orange Minnaar grips and orange Penthouse pedals to match the rear coil shock. There’s also a Burgtec bar, stem and seatpost on there too. We came across a muddy Habit upon leaving the show. 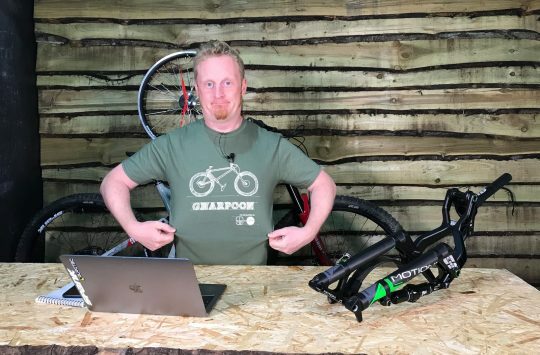 RatBoy’s personal Cannondale Habit is the full alloy model with a coil shock fitted and longer 160mm travel forks fitted up front. Of course, he runs his own signature 38mm Burgtec bars, a Burgtec stem and alloy Penthouse Mk4 pedals.